Come join us this weekend! Watch a cooking demo by professional chef and receive a free gift at selected Tesco stores when you purchase a minimum of RM30 on any Jasmine imported rice! FREE Jasmine Super5 (500g) imported rice for Jasmine Facebook Fans who visit our booth at participating Tesco stores below. Bring your family and friends to enjoy a special cooking demonstration by Jasmine’s Professional Chef! See you there! Gift redemption is valid only for purchases made at the selected Tesco outlets, which are Tesco Mutiara, Tesco Extra Selayang, Tesco Ipoh, Tesco Kampar, Tesco Jitra, Tesco Desa Tebrau, Tesco Puchong, Tesco Klang, Tesco Kulim, Tesco Bukit Puchong, Tesco Mutiara Rini and Tesco Extra Prai with purchase of minimum RM 30 of any of Jasmine imported rice from 31st July 2017 to 6th August 2017. Gift redemption is valid only for purchases made at the selected Tesco outlets, which are Tesco Puchong, Tesco Ampang, Tesco Ipoh, Tesco Extra Ipoh, Tesco Mergong, Tesco Bukit Indah, Tesco Extra Selayang , Tesco Setia Alam, Tesco Kulim, Tesco Bukit Puchong, Tesco Seri Alam, Tesco Kampar and Tesco Extra Prai with purchase of minimum RM 30 of any of Jasmine imported rice from 7th August 2017 to 13th August 2017. Gift redemption for Jasmine Facebook fans is valid only for the first 200 Jasmine Facebook Fans that visit the selected Tesco outlets, which are Tesco Kampar, Tesco Jitra, Tesco Desa Tebrau and Tesco Extra Selayang on from 4th August 2017 to 6th August 2017 at 10:00 am. 1 person is only allowed to redeem for 1 pack of Jasmine Super5 Imported Rice 500g. 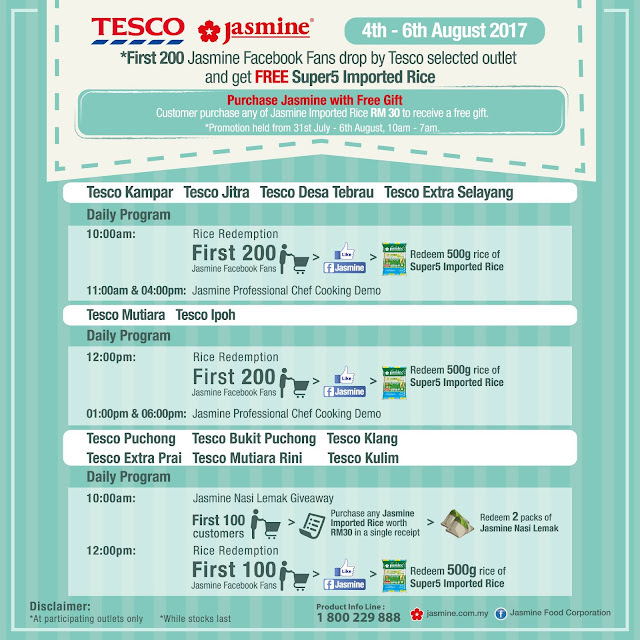 Gift redemption for Jasmine Facebook fans is valid only for first 200 Jasmine Facebook Fans that visit the selected Tesco outlets, which are Tesco Mutiara and Tesco Ipoh on 4th August 2017 to 6th August 2017 at 12:00pm. 1 person is only allowed to redeem for 1 pack of Jasmine Super5 Imported Rice 500g. Gift redemption for Jasmine Facebook fans is valid only for first 200 Jasmine Facebook Fans that visit the selected Tesco outlets, which are Tesco Extra Ipoh, Tesco Mergong, Tesco Bukit Indah and Tesco Puchong on 11th August 2017 to 13th August 2017 at 10:00am. 1 person is only allowed to redeem for 1 pack of Jasmine Super5 Imported Rice 500g. Gift redemption for Jasmine Facebook fans is valid only for first 200 Jasmine Facebook Fans that visit the selected Tesco outlets, which are Tesco Ampang and Tesco Ipoh on 11th August 2017 to 13th August 2017 at 10:00am. 1 person is only allowed to redeem for 1 pack of Jasmine Super5 Imported Rice 500g. Gift redemption for Jasmine Facebook fans is valid only for first 100 Jasmine Facebook Fans that visit the selected Tesco outlets, which are Tesco Puchong, Tesco Klang, Tesco Bukit Puchong, Tesco Kulim, Tesco Mutiara Rini and Tesco Extra Prai on 4th August 2017 to 6th August 2017 at 12:00pm. 1 person is only allowed to redeem for 1 pack of Jasmine Super5 Imported Rice 500g. Gift redemption for Jasmine Facebook fans is valid only for first 100 Jasmine Facebook Fans that visit the selected Tesco outlets, which are Tesco Extra Selayang, Tesco Setia Alam, Tesco Kulim, Tesco Bukit Puchong, Tesco Seri Alam, Tesco Kampar and Tesco Extra Prai on 11th August 2017 to 13th August 2017 at 12:00pm. 1 person is only allowed to redeem for 1 pack of Jasmine Super5 Imported Rice 500g. The promotion is only for selected Tesco outlets in peninsular Malaysia. Gifts are redeemed on a while-stocks-last basis and are only redeemable on the SAME day of purchase. Limited to one redemption of 500g of Jasmine Super5 imported rice for any purchase of minimum RM30 of Jasmine imported rice. To redeem the gift, consumer needs to show the receipt after made payment at cashier counter. No combination of spending of receipt is allowed. No combination of charge slips are allowed for repeat or multiple redemptions within the qualifying period. Redemptions are not valid for corporate purchasing or for business purpose. Jasmine Food Corporation Sdn Bhd remained and has the right to charge the value of the gifts should the transactions being cancelled or void or should the redemption be repeated. Gifts are non-transferable, non-exchangeable and non-replaceable for credit, cash or in-kind in all cases, whether in whole or in part. Jasmine Food Corporation Sdn Bhd does not warrant the quality, performance or fitness for the purpose of any prizes and shall not be responsible for any consequence including but not limited to loss of life, injury to person and/or damage to property arising from or in connection with the promotion and/or redemption or use of gifts. Jasmine Food Corporation Sdn Bhd reserves the right to terminate/ vary/ withdraw/ substitute this promotion at any time, without prior notice and without having to disclose any reason therefore and without any payment or compensation whatsoever. The decision of Jasmine Food Corporation Sdn Bhd on all matters relating to the promotion is final, conclusive and binding on all participants and no correspondence, whether relating to the allotment of redemption or otherwise, will be entertained.